Adrian Peterson's 90-yard touchdown run was the longest of his career. The Eagles prolonged their playoff hopes again on Monday, this time with what turned into an easy 28-13 win over the Washington Redskins, but it wasn’t a night without drama. What would an Eagles game be without something weird happening? It would be nice to find out some week, but wins are welcome for this team, however they arrive. And even the best game plan might have an unexpected glitch along the way. The Eagles defense survived a big one against the Redskins. 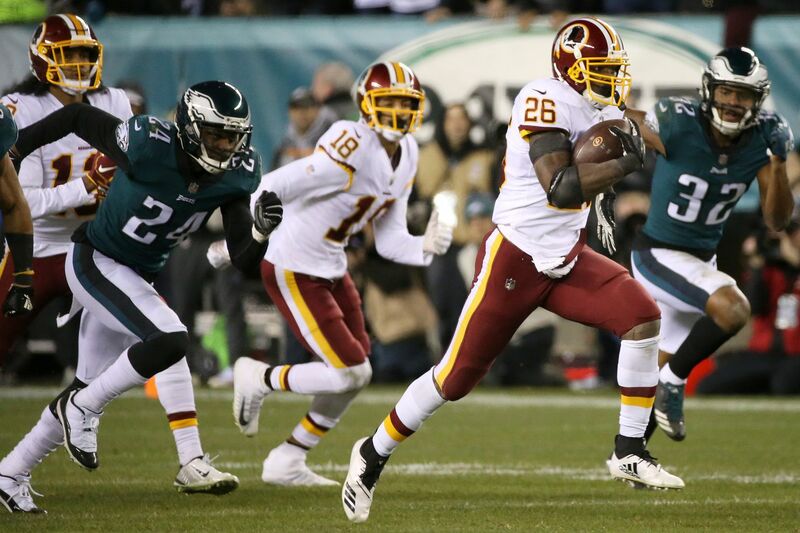 Coming into the game, the Eagles were focusing on stopping Adrian Peterson and the Washington running game for a number of very good reasons. The biggest might have been that the Eagles have been atrocious against the run in the last month or so. Troubles in the defensive backfield got most of the attention, but opponents were beating the Eagles at the line of scrimmage, too. After limiting teams to an average of 66 rushing yards in the first five games of the season, the Eagles had allowed an average of 135 rushing yards in the next six games. They were gashed by Saquon Barkley of the Giants, Ezekiel Elliott of the Cowboys and Mark Ingram of the Saints. If the Eagles’ defense was going to ever stabilize this season and prepare for a possible postseason push, that had to be addressed. They were hidden in part because in those five games, the Eagles didn’t play a team with a running game ranked higher than 18th in the league. The other certainty was that the Redskins, operating with backup quarterback Colt McCoy, would be looking to lean on Peterson and the running game for help. Peterson had been a bellwether for Washington success this season. He averaged 105 yards per game in their six wins and 26 yards per game in their five losses. The Redskins hadn’t lost a game in which he ran for more than 51 yards. Those were all very good reasons for the Eagles to concern themselves with stopping the run for a change, and the reasons grew even larger when McCoy went out with a broken fibula and was replaced by old friend and noted train wreck Mark Sanchez. The backup to the backup had been signed by the Redskins less than two weeks ago following the loss of starter Alex Smith. He hadn’t played a game since Jan. 1, 2017, for the Cowboys in a season-ending game against the Eagles at Lincoln Financial Field. >> DAVID MURPHY: The Eagles offense appears to have found its groove, but will it matter? The career arc of Mark Sanchez, like many of his passes, went way up early and came down quickly and in a bad place. If the Eagles could put the game on his arm on Monday night, that was the way to play. Unfortunately, both for that strategy and for their desire to stop the running game, the Redskins called a trap draw to Peterson on his first snap, from the Washington 10-yard line. The Eagles are still chasing Peterson, who went all 90 yards for a touchdown that gave Washington a 10-7 lead at that point. It was nearly the only effective run of the game for the Redskins, however, who only had 22 offensive plays and only ran the ball seven times in the first half. The other six rushes gained a combined 10 yards. In the third quarter, as the Eagles doubled down on their intensity, it went from bad to worse for Washington in that department. The Redskins ran the ball four times in that period for minus-3 yards. So, at the fourth quarter began, with the Eagles scoring to take a 22-13 lead, the Redskins not only couldn’t run the ball, they were forced by the scoreboard to throw it. That’s never been a good combination for Sanchez, and Peterson was reduced to being mostly a decoy. Sanchez threw the interception that everyone in the stadium was expecting fairly quickly and the doubt was removed from the evening, as was the subject of the Washington running game. On the night, the Eagles defended just 14 runs. They gave up a combined 14 yards on 13 of them, and 90 yards on the other. Weird, but that’s also a good description for the defense and the season. Next Sunday in Texas, the Eagles get another shot at stopping Elliott and the Cowboys. After that, they will see Todd Gurley of the Rams and Lamar Miller of the Texans -- both among the league leaders -- before finishing the regular schedule with a rematch against Peterson and the Redskins. It will be a tough finish for the Eagles run defense, but aside from that one little miscue on Monday night, there was an uptick against Washington. Credit Colt McCoy and Mark Sanchez with an assist perhaps, but they’ll take it.